Since I’m learning how to use a pressure canner for the first time, I thought I’d write a little tutorial for my blog readers. First of all, as a disclaimer, there is a lot to be learned about canning, and I’m sure that I will not be covering everything adequately for you to be canning on your own. So please take time to do your own research, and find a friend who has a bit of experience and knows safe canning methods. First of all, you need some basic equipment. Did you know although home canning has been around for decades, testing of the procedures was only begun in the 1990’s? So if you are looking to buy a reference book, you should look for something published after 1996. There are likely to be tested recipes similar to old family recipes, but it is important for food safety to use tested recipes. The National Center for Home Food Preservation is a great resource. You also need the produce that you are going to be canning. For the purpose of this tutorial, I am going to be describing the process of canning green beans. Trim ends and cut beans into 1 inch pieces. Now you have to choose if you are going to hot or cold pack. You can cook the beans in water before placing in jars in order to fit more in the jars, but the resulting product may not be as firm. There is little difference in the total length of time that it takes to complete each method, so hot pack is generally preferred. I may play around with this in the future, but for the moment, I am going to go through the hot pack method. Place beans in stockpot, and cover with boiling water. Boil for 5 minutes. Pack beans in clean quart jars. Cover with the water they were cooked in, leaving 1 inch headspace. You can add salt if desired. Contrary to popular belief, salt is not needed for safe preservation-it’s just for flavor. So if you’re trying to watch your sodium intake, home canning beans with no salt might be a good option for you! You can always add salt later. Wipe rim of jar with damp, clean paper towel. 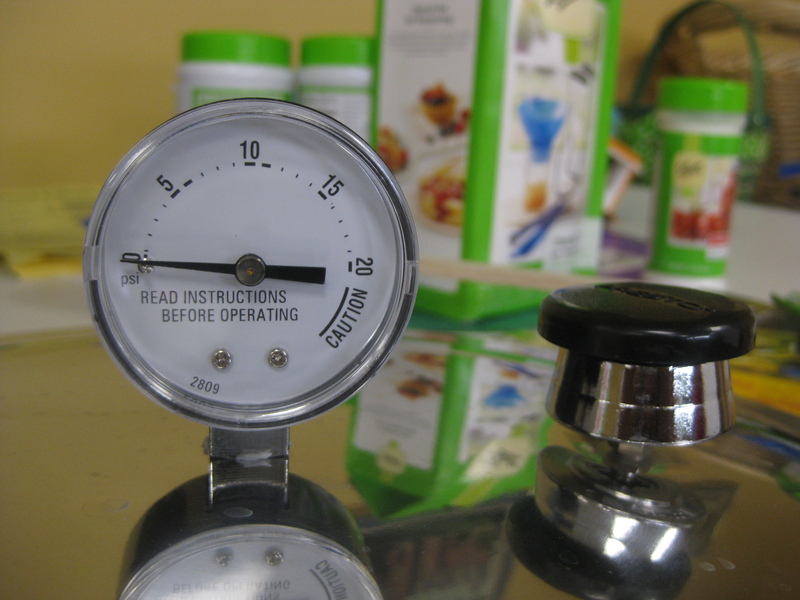 There are 2 types of pressure canners- dial-gauge and weighted-gauge. There are pros and cons to each, but today I’m going to focus on the dial-gauge. 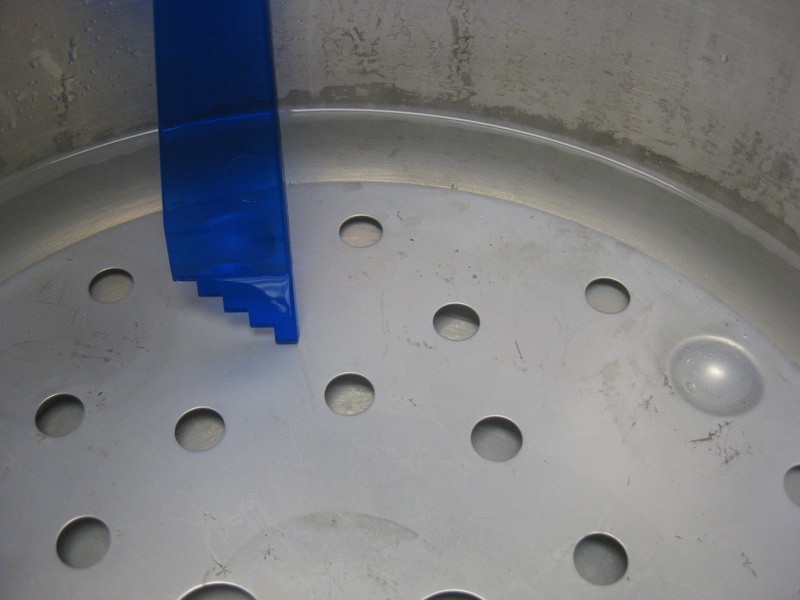 Place 2-3 inches of water in the bottom of the canner. Wait until steam begins to escape in a steady stream, and safety valve has popped up, and then count 10 minutes. Close vent by placing counter-weight on it. Start timing when correct pressure is reached- by looking at pressure gauge. 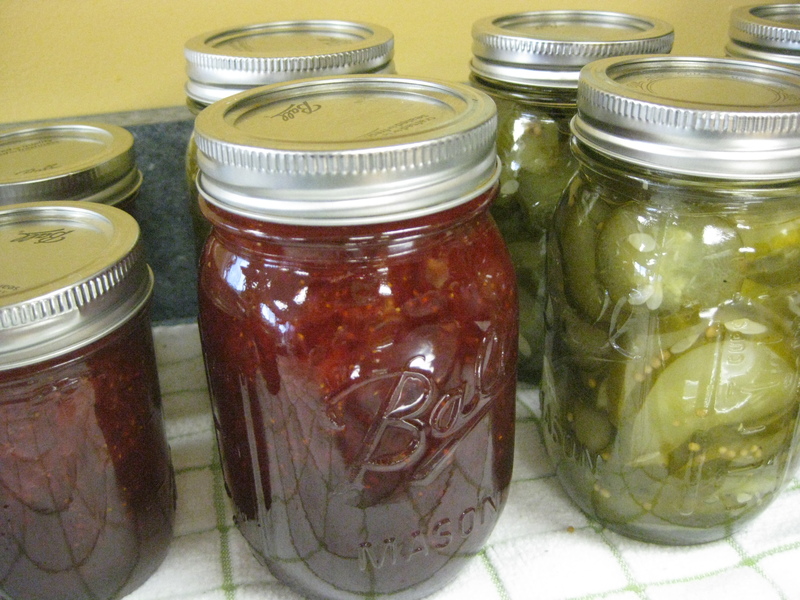 A gas stove allows for quicker adjustment of temperature, so is often more convenient for canning. At an altitude below 2,000 feet, hot and raw-packed beans should be processed for 25 minutes (quarts) or 20 minutes (pints) at a canner pressure of 11 lb. 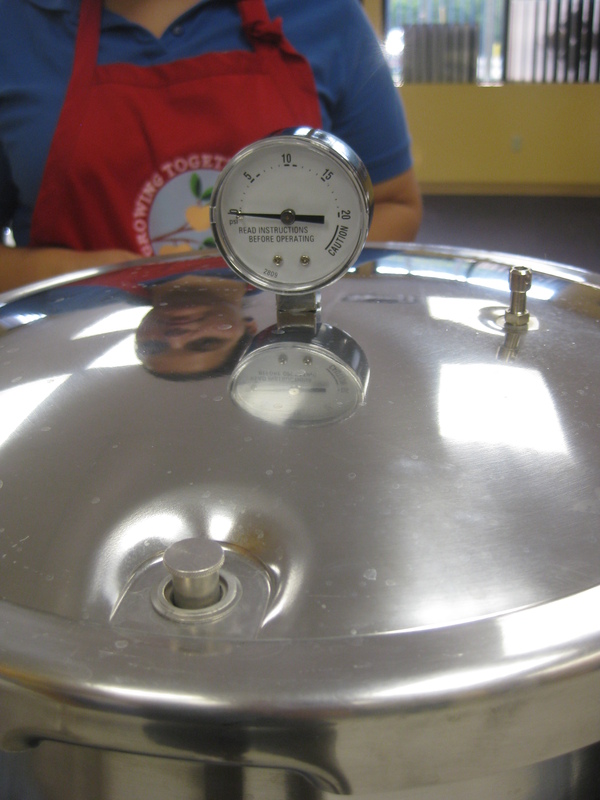 After time is finished, turn off heat, and wait until the canner has depressurized. With the dial gauge, you wait 1 minute after the indicator arm has dropped to zero. Remove counter-weight and wait for 10 minutes. Never force cool a canner. Remove lid from top of canner- opening away from face. 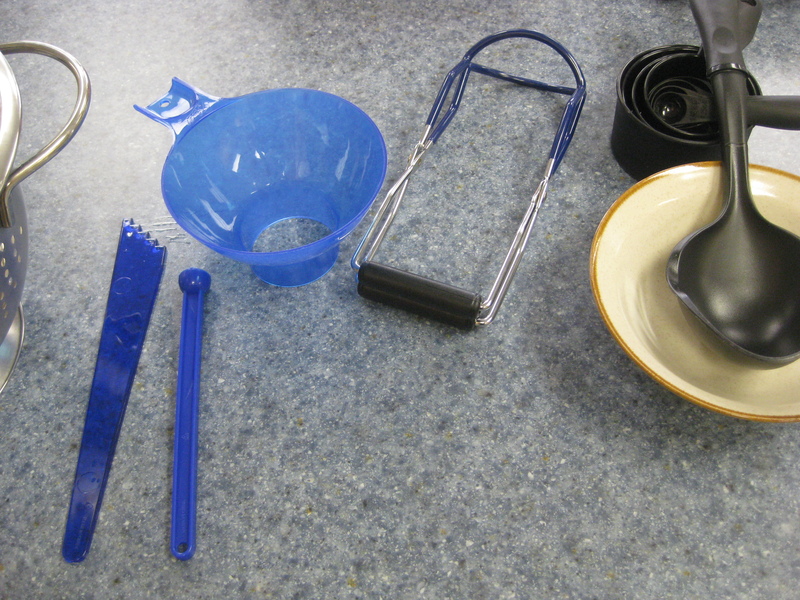 Remove jars from canner with a jar lifter and place on a padded surface. Remove rings, wipe, and store jars in a cool dark dry place between 50 and 70 degrees F.
It looks like a lot of work, and does take a bit of practice, but I think that preserving your own food is completely worth it. I’m not partial to canned green beans- I grew up simply blanching and freezing ours and I like the taste of frozen green beans. However, when freezer space is at a premium, I can see how canning green beans would be convenient. On the flip side, there are likely more vitamins (I’m thinking particularly vitamin C) that would be lost in canned beans since there is more heat processing. According to the University of Georgia, recent research shows that for some products such as tomatoes, pressure canning results in a higher quality and more nutritious product than food processed in a boiling water bath. This is likely due to the shorter processing time. Categories: Community Nutrition | Tags: canning, green beans | Permalink.